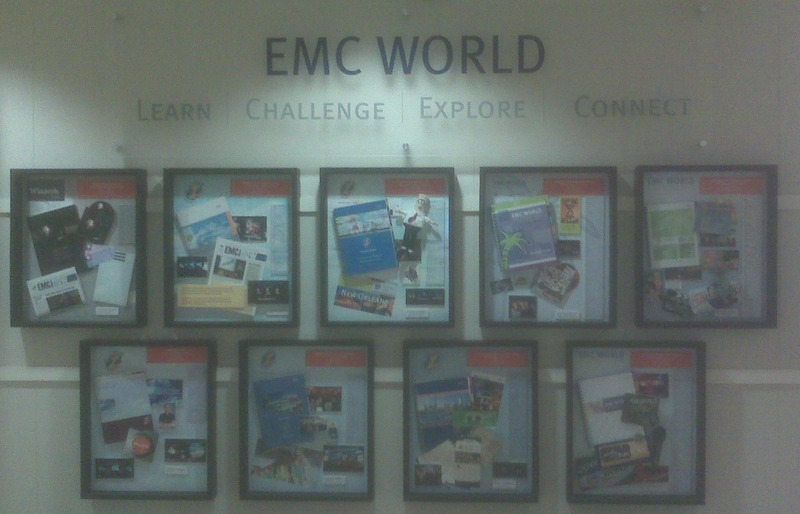 ♫ It’s the most wonderful time of the year ♪ For many of us at EMC, the busiest and best week of the year is EMC World. This year’s event – May 10-13 in Boston – will be my 8th year attending (below is a picture of photoboxes here at corporate HQ commemorating the events). I thought that I would share my conference agenda; if you are registered for the conference, there is a nice My Agenda Scheduler tool on the EMC World site. I will be focusing on the networking related sessions. Tuesday is the best night to go out for a nice dinner and there are also typically a number of parties (you can usually find out details from vendors on the Exhibition Floor). 5pm-6pm: Virtualization Technology and Directions presented by David Black, PhD – this is a great overview covering how virtualization technologies and solutions are applied to network, server and storage. Wednesday night is the big conference event at Faneuil Hall. There are also plenty of great sessions on Thursday, but I’m usually wiped out by Wednesday night. During some of the Exhibition Floor hours, I will be in the EMC Community Network (ECN) booth for discussions about the Innovation & Research community that we have on Labs. When not in a session or on the Exhibition Floor, I will be spending time at the Blogger’s Lounge (sign up at the wiki). For those not attending EMC World in person (there is still time to register), there will be a microsite where you will find Twitter, blog and video updates from the conference (I’ll post the link as soon as it’s available). The official Twitter account for the conference is @emcworld and the hashtag is #emcworld. All times at the conference are subject to change. I’ll post any updates or additional sessions of interest on this site. I’m looking forward to all of the discussions in person and on-line. Please post comments below or ping me on Twitter if I can be of any assistance. If you’re new to this site, please consider subscribing to this blog. 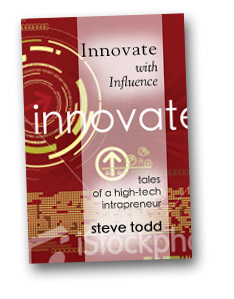 I recently read a book written by a coworker, Steve Todd, Innovate with Influence . The book tells the story of Steve’s career, the storage industry from RAID to XAM and gives some good lessons about influence and innovation. Steve talks about how he has created innovative products through connecting adjacent areas of expertise and knowledge – what he calls Venn Diagram Innovation (and Venn diagrams are just the coolest). This topic resonates strongly with me on how when you make connections both internally in a company (breaking out of the “silos of excellence”) and to external communities. Inside a large corporation, it becomes very easy to always interact with the same people. Connecting with people outside of your work area will not only expand your knowledge, but helps to bring you fresh perspectives. In the online community, there is also the opportunity to span between different groups of people. Whether you are talking about blogs, Facebook or Twitter, it can be very interesting when you span multiple interests. My primary technology focus is storage and virtualization, but I learn a lot from the innovation and social media communities. There are often unexpected overlaps between the various groups and lessons that can be learned from all of the groups that can be applied across the board. While it’s true that if you want to be the “expert” in a certain field that staying focused on a specific topic can help build your brand, most people wear more than one hat and you shouldn’t be afraid to post and engage on more than one topic. What I have also found, is that if you are really willing to engage, that it is still easy to converse with real thought leaders that are online. If you become part of the 1% of the internet that is contributing on a certain area, you can become well known on the subject and get to know others who are driving thought leadership. I’d recommend picking up a copy of Steve’s book (Disclaimer: Steve is a friend a colleague, but I bought my copy and was not asked to write this post). For some background on other business books that I’ve enjoyed, see my post Read this or fail to communicate from last year. I’m always interested in hearing of good business books, I like storytellers with some applicable lessons, please comment on anything that you’d recommend. If you’re new to this site, please consider subscribing to this blog. 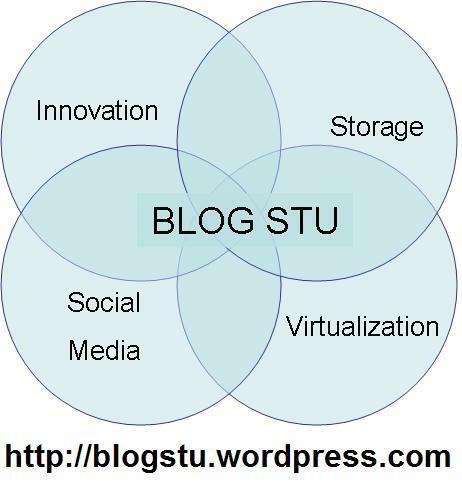 You are currently browsing the Blog Stu - Stuart Miniman blog archives for April, 2010.